Bilby is definitely the odd one out. All his friends love to read and are members of the Bush Book Club, but Bilby would rather do anything else! Echidna reads in bed; Kangaroo can hop and read; Koala can't get enough of fantasy stories; while Crocodile has a bit of a soft spot for stories that make him cry. But Bilby just can't sit still long enough to read more than a sentence or two. One day, he gets bored playing by himself and so sneaks in to listen to a Book Club meeting, but that's so boring he falls asleep. And when he wakes up, everyone's locked up and gone home. What can he possibly do now surrounded by nothing but … books?! Margaret Wild is one of Australia's favourite children's book authors, and her recent title Tanglewood was shortlisted for the 2013 CBCA Awards. Her deft touch with words is again evident here in this gorgeous story about what it really means to love books. Ben Wood's illustrations are the perfect playful accompaniment. 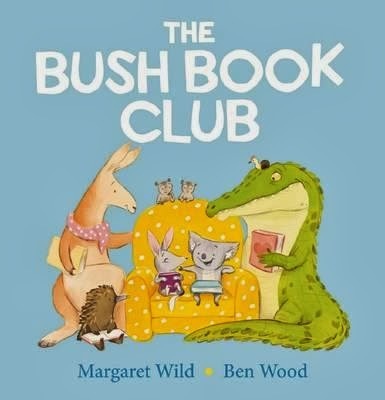 Australian native animals combined with a wonderful message — The Bush Book Club is sure to be a hit with children, parents and teachers.